Each of the five units in this online course contain educational interactives that teach a key concept of social justice as it relates to public health inequity. One of the interactives is featured below. To see others, go to the menu and click on "Preview Interactives." In the 1950's, the City of New York quietly decided to build a massive sewage treatment plant in West Harlem. 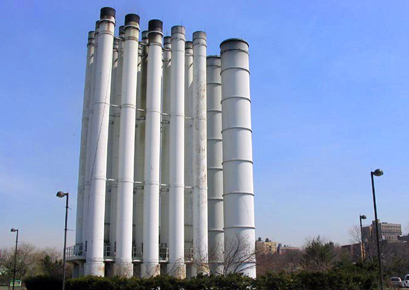 The plant protected the Hudson River, but its air pollution made nearby residents sick. Fed up with the communitys skyrocketing rates of asthma and other respiratory diseases, residents formed a coalition to confront the disturbing history behind the plants placement and construction. 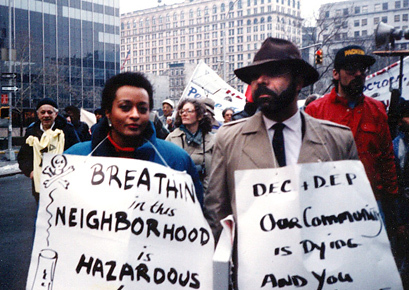 Peggy Shepard, Chuck Sutton, and Vernice Miller (not pictured) co-founded the community group West Harlem Environmental Action (WE-ACT). Smokestacks at the North River Wastewater Treatment Plant. 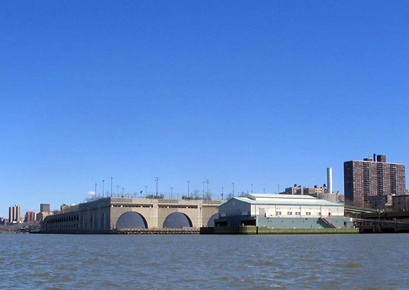 The North River Wastewater Treatment Plant is located on the Hudson River, west of the West Side Highway from 137th Street to 145th Street. 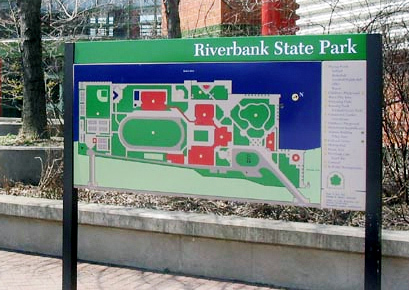 Riverbank State Park is a 28-acre park built on the top of the North River Wastewater Treatment Plant. 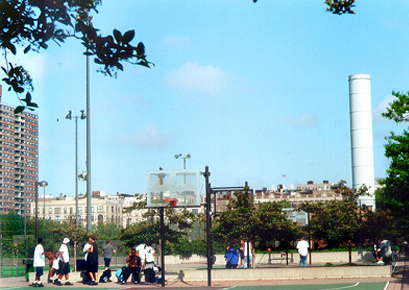 West Harlem residents play basketball at Riverbank Park. Smokestacks from the treatment plant can be seen in the background. 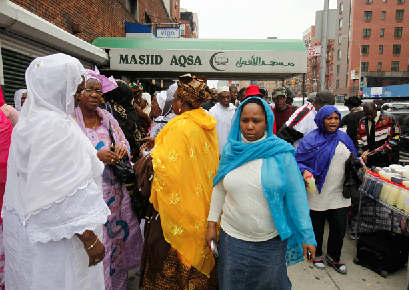 While West Harlem is a vibrant, ethnically diverse community, one-third of its residents live below the poverty line. 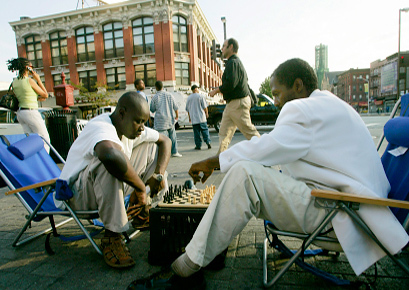 Two men enjoy the sunshine and a game of chess on a warm day. 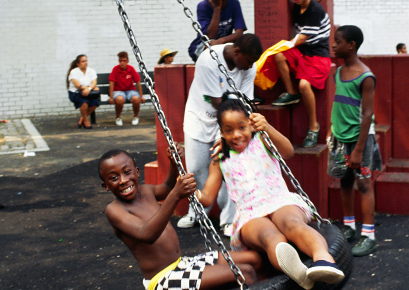 A playground swing brings a happy smile to young faces as adults look on in the background. 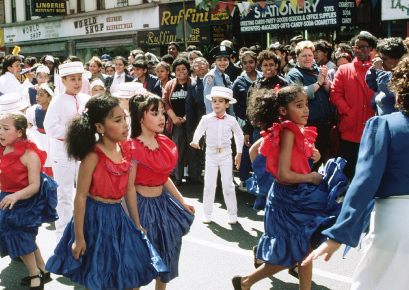 Harlem residents watch and applaud as local kids march in a street parade. 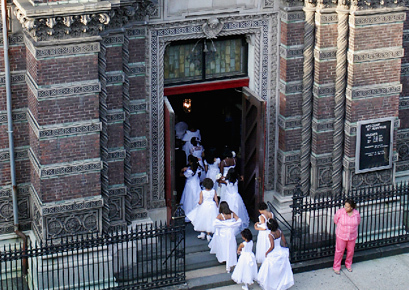 Girls in white dresses enter St. Aloysius Church for their First Communion. St. Aloysius was built in 1902-04 to the design of William W. Renwick. 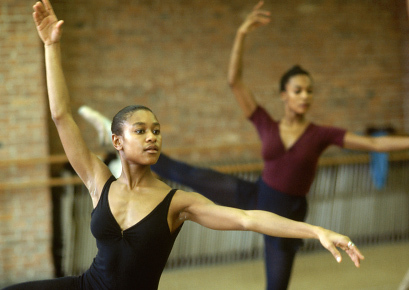 Harlem has a long history as a cultural center for music, art and dance. Click and drag in this map to see the what is located near the plant. The story of West Harlem's fight against the North River Water Pollution Control Plant uncovers several important themes for social justice advocates who are addressing health inequities. The above interactive presentation tells the account of decision-making that either excluded local residents or offered only superficial opportunities for engagement. Listen to the story, click through the slideshow and notice the critical decision points and opportunities for public health department intervention. Share this information on social justice and health inequity. This project was made possible through support from the National Institutes of Health.